Easy, vegetarian and full of goodness! Our sweet potato quinoa burgers are the perfect addition to any lunch! We did it! We made it through two weeks of being pescetarians! And ya know what? It wasn’t that hard at all! Ok, so it was only two weeks, but let me tell you, we could definitely feel a HUGE change, it was quite amazing! For the past two weeks, we cut out red meat, chicken, pork and any other meat other than sustainable fish and seafood. 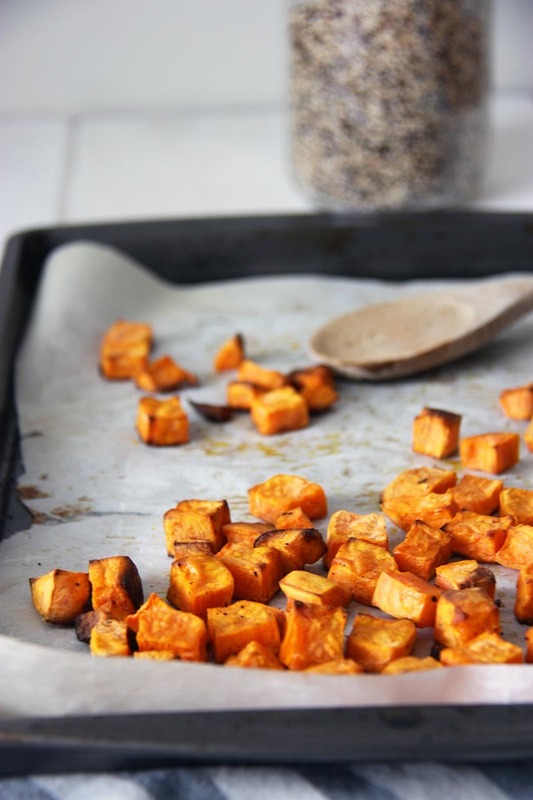 We upped our vegetable and grain intake and came up with some seriously amazing new recipes! We learned a lot as well, about each other, about our bodies, and about the beauty of a balanced diet. So let’s tell you what we learned! Holy moly. I don’t think either of us has ever experienced anything quite like it before. I guess that’s what happens when you up your bean, chickpea, vegetable and lentil intake. Wow-ee. For the first few days, let me tell you, we almost did not want to go into our apartment, it was like all hell had broken loose. We were passing the most toxic smelling gas I think I have ever had before. Luckily, when you’ve been together as long as us, these things don’t really matter as much as they used to. But if you’re particular about farting in front of your particular other, or are about to get into a new relationship, I’d probably go pescetarian a little later on! Thank goodness that phase took about 2-3 days to pass because I’m not sure how long either of us could have put up with it any longer. So what did we learn – if you cut out meat, prepare to fart. A lot. I actually cannot believe how much better my stomach felt after the first initial gassy stage. I always had a tendency, especially in the afternoons to have a problem with bloating, but this problem was literally gone within a few days of starting a pescetarian diet. It was amazing. Both of us felt so much lighter. Both of us lost about 2-4 pounds (1-2kg) between us, and I alone went down from 22.8% body fat, to 22% body fat which I thought was amazing! It was seriously amazing to see the difference just in two weeks. We thought this would be our biggest challenge but it turned out to be ok! We kind of avoided eating out at restaurants. My theory with eating out is that it should be special occasions where you can have the time to enjoy your meal. Usually, when we go out we try to eat at good quality restaurants that use local ingredients, but we couldn’t justify spending money on just a seafood or vegetarian meal when there would be so many other delicious options available. The one food truck we did find one night, was seriously one of the best vegetarian meals I have had! We went out to Wolf & Bear one night and had the falafel and ‘out to lunch’. I would go back there in second it was THAT good! The other problem we (mainly I) faced was probably the most challenging part of the last two weeks – being hungover and not being able to eat meat! After the Australian Football Grand Final I was ridiculously hungover and starving. And I was just so hangry all day because I knew that I needed something greasy like a burger. Vegetables that day did not cut it. So I went home and made was was arguably the worst meal I have made in a long time, because ya know that’s what you do when you’re hungover! Needless to say, that was a disappointing day for me! The great thing about being pescetarian was the ability to branch out and create new meals, like our sweet potato quinoa burgers. When you’re a little limited, it forces you to be creative and come up with not only vegetarian meals but also meals that were full of iron and protein. We ate a lot of sweet potato quinoa burgers for lunches, huge roast vegetable salads, our favourite dhal, and even had a dinner party one night with our friends that was vegetarian (pumpkin, ricotta & sage lasagna, so good!). We also experimented with fish tacos, had sheet pan salmon and a lot more white fish which was so good! We learned a lot during this process, and by the end of it, we didn’t really crave anything. Sunday was the day we could eat meat again, so we had bacon for breakfast and you know what? It didn’t even taste that good. It smelt like chemicals and just wasn’t good! We ate pork potstickers for lunch, then by dinner we thought ‘eff it’ we’re just going to eat vegetarian again so made a beautiful, warming carrot, honey and ginger soup for dinner. We’ve decided now that probably 4-5 times a week we will only eat fish and vegetarian meals, and then only, and if only we can find local, organic, grass fed and chemical free meat, will we eat it (where possible). Overall, trialing a predominantly pescetarian diet for the past two weeks has been really insightful, and we could definitely see the benefits. Both of us felt lighter, lost weight, slept better, and generally just felt like we had so much more energy! 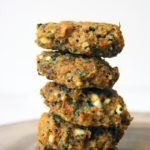 Let’s celebrate and make sweet potato quinoa burgers! 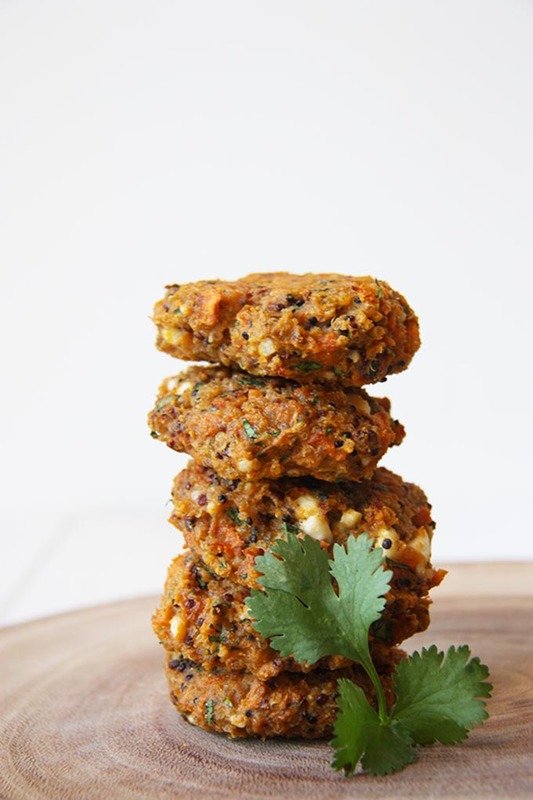 So in celebration of our very successful pescetarian fortnight, we’re sharing our favourite go-to lunch recipe for our sweet potato quinoa burgers. We had these pretty much once a week as they just made such a perfect addition to lunches. We swapped our regular lunch chicken for these and they are so good. They kept us fuller for longer and had a perfect balance of flavour. The cumin and coriander (fresh and ground) really added an extra flavour hit to it, and the oat flour, egg, and quinoa meant we were getting our dose of protein. You can cook these two ways – either on the stove top in a lightly oiled fry pan for a couple of minutes on each side or in the oven for about 10-15 minutes, flipping halfway. Both ways are both really delicious! 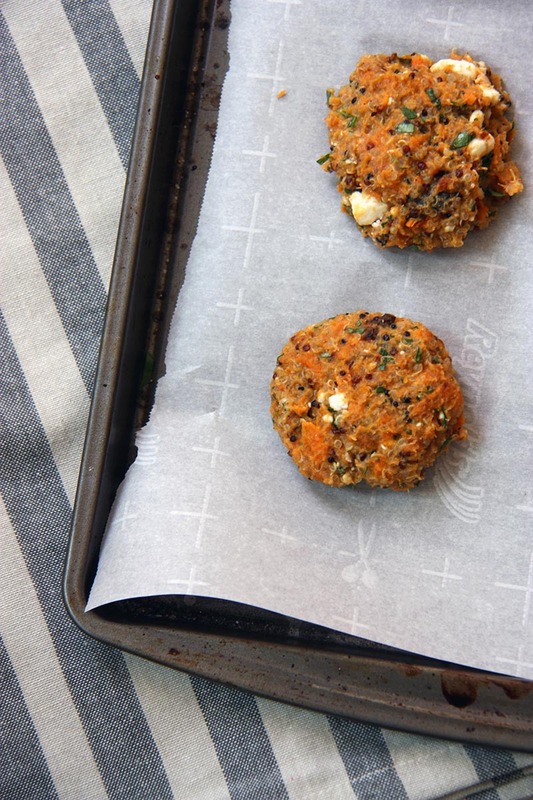 These sweet potato quinoa burgers are bursting full of flavour. Packed full of goodness, these are a new lunch favourite. Add quinoa, oat flour, egg, cumin, ground cilantro, cilantro and feta and mix until well combined. Season well with salt and pepper. Heat olive oil in a large pan and fry burgers about 2-3 minutes on each side until golden brown, flip and repeat process. Serve with salads or in a wrap.